Gourds are a staple in autumnal centerpieces on dinner tables, while their cousins like pumpkins and melons more often make it to the dinner plate. Many gourds are best left to fall crafts, but a few are edible and flexible enough to be used in a variety of dishes. Cooking gourds isn't as much work as you might think, and since they're fat-free and filling, the end result is worth the effort. Gourds belong to the plant family known as Cucurbits. Most gourds aren't for eating. Hardshell gourds are the type used to make bowls and musical instruments; they're green on the vine but turn tan or brown as they age. Ornamental gourds are the type you'll usually see for sale around Halloween; they come in colors like green, orange and yellow and are used as decoration. Both hardshell and ornamental gourds come in a variety of shapes and sizes. Luffa gourds are cucumber-shaped and, if left on the vine for long enough, turn hard and can be used as sponges. While the fully ripened luffa gourd is inedible, young luffa can be eaten. It's also known as Chinese okra. Choose a luffa gourd that is no longer than 6 inches to ensure it's young enough to be eaten; its peel should be green. Another type of edible gourd is the bottle gourd, also known as calabash. The bottle gourd is considered a hardshell gourd, but the flesh is edible. Bottle gourds are green and often resemble either a fat cucumber or an eggplant. A longer, thinner version of the bottle gourd is called the cucuzzi, or "Italian edible" gourd. Edible gourds have a mild, zucchini-like flavor. Peel your gourds carefully to ensure you don't leave any bitter skin behind. Try using a vegetable peeler, but if the skin is too hard, use a paring knife to remove the gourd's skin from its white flesh. Slice the peeled gourd in half and scoop out the spongy, seed-filled center, then chop the rest of the flesh into cubes the size of sugar cubes or slice it thinly. Cook the pieces in boiling water for 15 to 20 minutes, or until they're fork-tender. Edible gourds are commonly used in Asian cuisine. Add the cooked chunks to dumpling filling or toss them with Chinese noodle dishes. 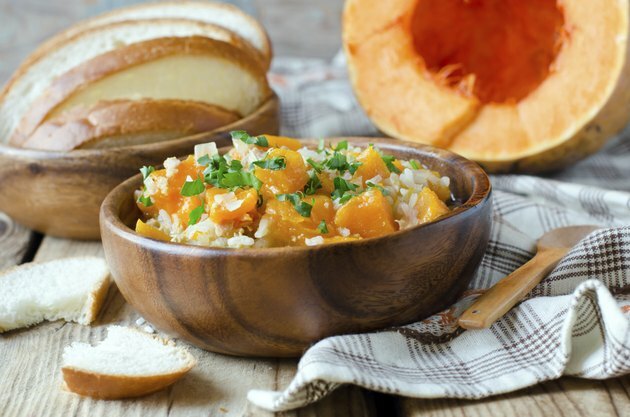 Use gourd pieces in an Indian curry to spoon over rice, or add them raw to a pot of vegetable soup seasoned with Indian spices and let the pieces cook in the stock. If you prefer crisp pieces of gourd, add the raw slices to a wok along with carrots, onions, peapods or any other veggies you like. Drizzle in a tablespoon of oil and and saute the mixture until everything starts to brown. Finish the dish with a bit of soy sauce and sesame seeds and serve the stir-fry over brown rice.